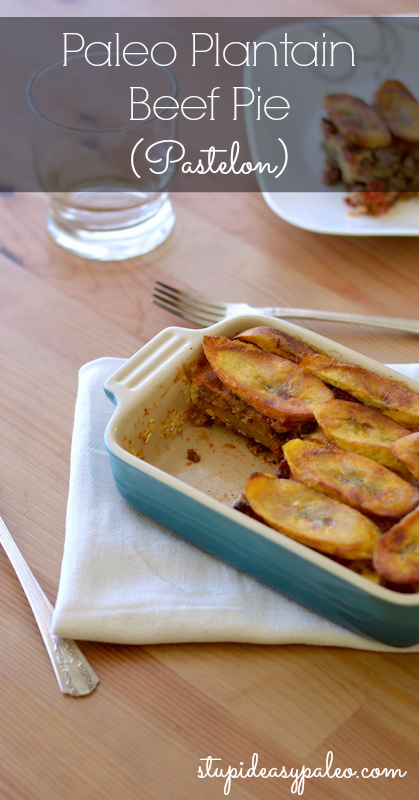 Paleo Plantain Beef Pie…holy cow! 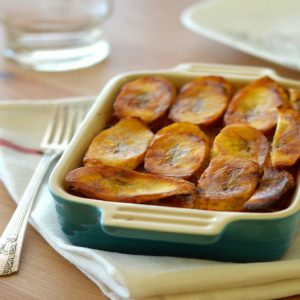 What is Paleo Plantain Beef Pie? As one of my readers pointed out, this dish is popular in Caribbean cuisine and is often called pinon or pastelon. The plantains and currants add a bit of sweetness which is balanced by the olives and vinegar. Okay, my mouth just watered writing that. If you want to make this, be sure to plan ahead and check what the plantains at your market look like. Here they are always super green. You’ll want slightly ripe plantains for this recipe. They should yield gently to pressure and have greenish, yellow skin with some dark spots. If you can’t find achiote powder, paprika is a good substitute. After I put this dish in the oven on Sunday afternoon, I had to go down the street to the market for a couple ingredients for another recipe. I came back 15 minutes later to the most amazing smells wafting out of my apartment. This takes a bit more time than my weekday, go-to recipes, but it’s perfect for putting together on the weekend when you’re relaxed and not rushed. I honestly won’t have enough left to freeze (because the whole thing is going to be eaten), but I suspect that tightly wrapped, it would freeze quite well. This recipe is so tasty that I think it’s wise to double the ingredients and make a 13″ x 9″ dish full instead of the smaller batch, especially if you are feeding more than two people. 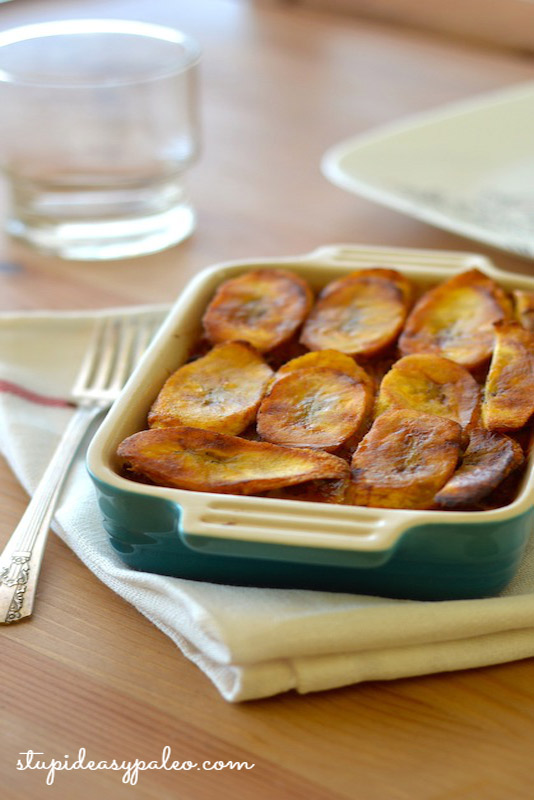 Paleo Plantain Beef Pie, better known as pastelon, is a savory beef casserole type dish. This version is gluten-free and whole30. Preheat the oven to 350°F. 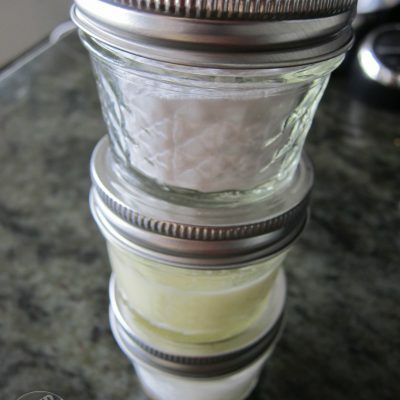 Grease the inside of an 8″ x 8″ baking dish with coconut oil and set aside. Heat a large skillet over medium-high heat. Brown the ground beef completely. Lower the heat and to the same skillet, add the red pepper, onion and bay leaf. Cook for 4–5 minutes until the veggies are softened. Peel and slice the plantains into ⅓” diagonal pieces. To peel, cut off both ends and slice through the skin lengthwise, then peel off in sections. If any skin remains, trim it off with a knife. In another skillet (I like cast iron for this task) over medium heat, add a couple tablespoons of coconut oil and begin to brown the plantains in a single layer, about 2 minutes per side. You’ll have to do this a few times until all the plantains are golden brown. Caution: If you walk away or get distracted, these will easily burn. Remove to a paper towel-lined plate to drain. In a small bowl, whisk the eggs and water. Bake for about 45 minutes or until the eggs are set. Let sit for 10 minutes before you slice into the pie. 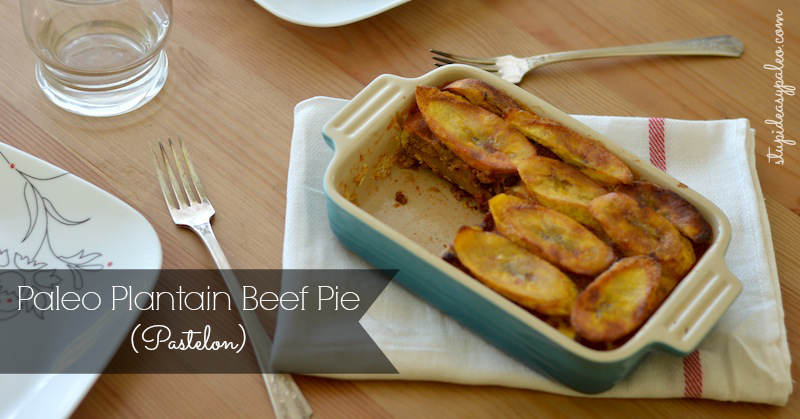 Pin this Paleo Plantain Beef Pie for later! This looks like it’d be difficult not to consume the entire pan in one sitting. Hi Lyn! GREAT question! How about thinly sliced sweet potato (or even potato if you eat it)? You could probably use a nice firm squash. Slice, bake or fry and layer? I think butternut would be a great substitute…I’m thinking roasted would give the best result. Definitely let me know which modification you ended up going with. Hi, great recipe, This is a very common dish known at pinon or pastelon in Puerto Rico & Cuba. Just curious: why didn’t you discuss the Caribbean origin of this dish? I will definitely go back and mention it, but I’ll admit I have no expertise in Caribbean cuisine (though I’d like to learn more)! Island food is terrific! Lots of avocado, mango, coconut, olives (and, and of course, meat & seafood)… all the good stuff 🙂 and without a lot of hidden grains (mainly rice, which is easily subbed out). Have you tried mofongo? Puerto Rican tamales? (they use mashed plantain instead of cornmeal)… so much good stuff! Thanks for sharing this recipe and opening up the topic! I’ve never traveled to the Caribbean but it’s high up on my list of places to visit. Experiencing a culture through its food is one of the most amazing experiences. I haven’t tried either of those but I do have a good friend who is Puertorriquena so I’m going to pick her brain! Have you spent time there? It sounds wonderful! This looks delicious! But I’m not a big fan of either currants or raisins. Do you think the dish would be as good without them, or does it need that extra touch of sweetness? Can you recommend a substitute? Hi Nancy! I think it would be just as good without it. I’m thinking something like a few chopped dates or dried apricots would add a hint of sweet but I don’t think it’s necessary. The plantains, when slightly ripe, will have their own sweetness 🙂 I’m so happy to have heard from you! Love you, DenMo! That looks amazing! Thanks for the great recipe can’t wait to give it a try! This looks delicious! I can’t wait to try it. Thanks for sharing the recipe. Does anyone know how well it freezes? Hi Alyssa…I didn’t try freezing it but I’m guessing it would do pretty well. Made it, ate it, loved it. Good lord, it’s delicious. WELL worth the effort! Awesome recipe, Steph! JUMPING UP AND DOWN with happiness! 🙂 Stoked you liked it! Made this dish today, and left the house briefly while it was in the oven. OMG it smelled so good when I came back, and tastes great! Thank you. Made this tonight for my family (husband & 2 sons ages 10 & 13). Was a BIG hit. Thank you!! That’s a huge win! Thanks for letting me know, Sarah! So freaking good! Seriously. I doubled this recipe and made it on a Sunday evening. The BF and I were able to eat this throughout the week. It made A LOT. Perfect for two busy people! I never cooked with plantains before and was worried b/c mine were still a bit green but they turned out great. Not very sweet… more like a potato than a banana in flavor. The only downside is it took me a long time to cook. Almost 2 hours before I could put this bad boy into the oven. Not sure if I’m just slow or if doubling the recipe just took a long time. Either way it was worth it. Thanks a bunch! Hi Kamila (beautiful name, by the way)! I’m really happy to hear that you enjoyed it. Good for you for trying something new. I know it can be a risk when you take the time (and money) to buy the ingredients and cook the dish only to find out it’s not for your taste buds…but I’m SUPER glad that wasn’t the case with this one. The frying of the plantains can definitely take some time! Thank you SO much for the feedback! I’m glad you all liked it!! making this now and am afraid i’m eating the plaintains as the fry! SOOO delicious–I’ve never had them before. But I know it will be worth the wait if I can just…stop…myself…from…reaching…for…one……..more! How did it turn out? 🙂 Those plantains frying up are so good!! It was incredible! And we’re making it again today! This time with sweet potatoes…they ran out of plaintains at the store 🙁 Thanks for the awesome blossom recipe! Sweet potatoes would be a GREAT substitute…I like your resourcefulness! Good lord this one was delicious. And I’ve already shared it with two people. So excited to try your other recipes too!! Keep it up. Hi Allison! That is SO COOL 🙂 Thanks for letting me know…it put a smile on my face! SOOOOO good, this was outrageous! Just started crossfitting and made this tonight. SO freaking good. Culinary PR. I ended up eating half the plantains as they finished frying so I finished the dish with half plantains and half sweet potato. Ahhhhh that’s so awesome 🙂 I’m really glad to hear! Plantains are a good healthy carb replacement. Thanks for stopping by! If I was to include cheese, how and how much would you use? I eat dairy and browsing other recipes, it seems like it’s a fairly common ingredient in this dish. Hi Dean…yes the original dish calls for cheese in each layer. I guess it depends on how cheesy you want it to be but my guess would be about 2 cups of something grated. Thanks, I’ll let you know the results. By the way, how much would you say 4-5 plantains weigh in accordance with this recipe? I bought five plantains at the store and it came out to 3.64 lbs., which seems a little high in comparison to only one lb. of ground beef. This dish was amazing! So many flavors going on just when your mouth thinks it knows what’s going on the flavor profile changes. This is a definite do-over for us. I shared this with a co worker who has had the dish in the Spanish culture and she LOVED this version requesting the recipe for herself. Thank you, Sue! I’m really happy you liked it, and the fact that it got another thumbs up is even better!! Awesome! Hello! I’ve been semi paleo for a few weeks now and just this week I took the Whole 30 plunge. I’ve been using a lot of your recipes to get me through the week. I want to add this to my meal plan for next week. I don’t see any reason why this wouldn’t be Whole 30. Would you agree? They’re closely related but not the same. 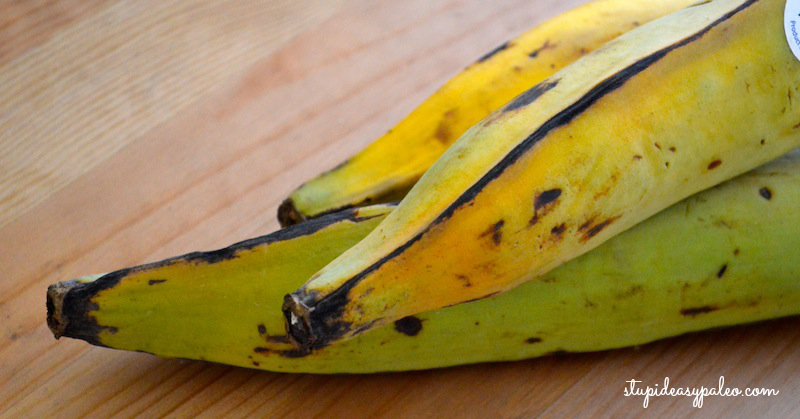 Plantains tend to be much starchier and take a very long time to ripen. Yay! Thank you Jamee 🙂 Agreed…so worth it! I hope you like it! I so want to try this but I’m allergic to eggs. Do you think I could just omit the egg or is there something I could replace it with? You can definitely omit them. Has anyone tried making then freezing? Was thinking of making and assembling then instead of popping it in the oven, freezing it to take up to Christmas with my non paleo family… Have to go prepared for my husband and I so any frozen casserole type dishes are ideal! Let me know! I think it’ll do well but I’m not 100% familiar with how plantains hold up when frozen. This recipe is on my list of ones to make again and reshoot I’ll experiment and post up how it does. Great, thanks! In the meantime I think Ill go for it! Ill let you know how it goes! Do you know roughly how many portions this is? Hi Sarah…totally depends on the size of the appetite, but it’s quite filling and I got at least 4-6 dinner portions (when combined with veggies on the side) out of it. I agree with Steph, it just depends. We had enough for dinner for two people, including seconds for the hubs, and then we both had some for lunch the next day. We also supplemented with veggie sides. Hi Steph. Thanks so much for replying. I made this today and it is AWESOME! I think my plantains were slightly too ripe, so next time I’ll use firmer ones. But it’s still AWESOME. Regarding portions… I’ve got 2 large dinner portions (for post-workout days) and 3 smaller portions lunch-box portions (or for rest days). I had mine with a side of coleslaw (made using my homemade mayo, made for the first time ever!). Any other suggestions for what to serve it with? I’m doing Whole30 for the second time, starting tomorrow. I reckon this is Whole30 compliant, isn’t it? Love it!! Sometimes they can get a little bit smooshy, for sure. Ah perfect! That’s about what I got out of mine. 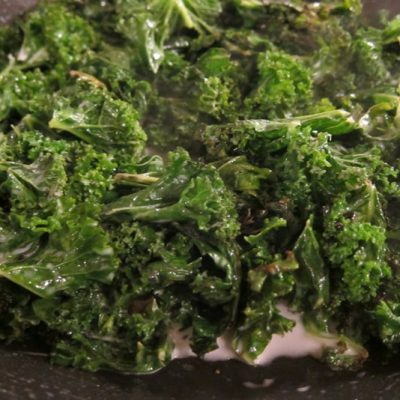 I would love it with some cauliflower rice or maybe some sauteed kale or spinach. It’s definitely Whole30-friendly! Wow this recipe was awesome until I baked it for an hour:(. It dried out significantly and lost a lot of flavor. I will make this again but cut the time in half. The only thing you are adding is egg and typical egg casseroles cook 30-40 minutes. Lost flavor how? The meat? The recipe says black or green olives. Since the flavor in these two types is so different, is there one that you recommend more than the other? Either one is really great, but I prefer the green in this one. I made this on the weekend and it was amazing! There was enough left overs for lunch and a couple servings to freeze for another time. I will be making this again very soon!! Like to try this Plantain Paleo beef receipe, but have to avoid nightshades, any suggestion for tomato and green pepper substitution will be greatly apprciated. This is fantastic. I was so looking forward to making this that I forgot that our oven was out of service. Ended up baking it in the toaster oven using 8 x 8 silicon baking dish. A real keeper. 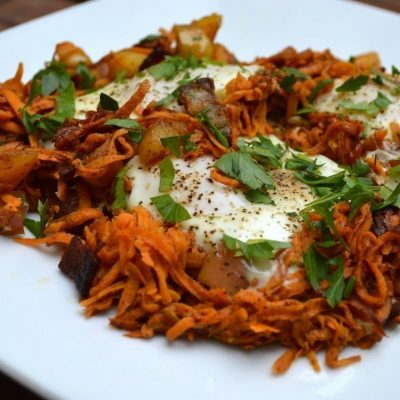 In fact, even if you bail out before adding the egg and plantains, it makes for an awesome paleo sloppy joe type dish. Mmmmmmm sloppy joes!! That’s a great idea! 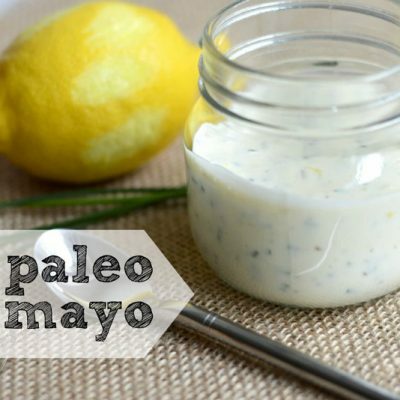 This was insanely delicious—probably my favorite paleo dish I’ve ever made. We served it to guests and they loved it, too. Thanks! This was SO GOOD! The meat mixture will def be making an appearance in stuffed peppers, etc too. Easy to make, slightly time consuming frying the plantains but I also used a tiny pan since the bigger pan I had had the meat in it. I’ve been looking forward to leftovers all day! Thanks! Looks great and I would like to try this. Unfortunately the first 2 steps are entirely covered by a pop up ad for Chiles with no x to close it which I found very annoying. 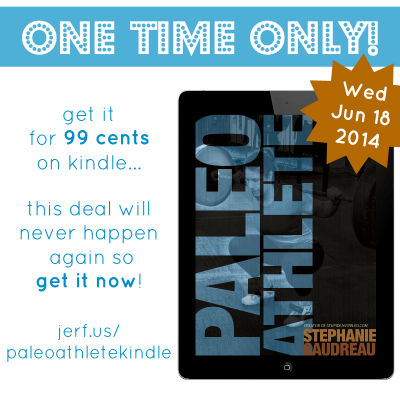 I’ve been eating paleo for over 7 years now. I have to say this is one of my favorite recipes to date…and I’ve made hundreds of recipes! It’s so flavorful and satisfying! I’m making extras today to stick some in the freezer for next time! Thank you so much for this creative recipe! Wow Rachel that is a very high honor and compliment. Thank you so much for brightening my day! How necessary are the eggs? Could I substitute with flax or chia seed eggs? Hi Jodi…it’s more for appearance than flavor. If you’re unable to eat eggs, I would omit. It’ll still be just as tasty. For anyone wondering if this recipe is worth the work: ABSOLUTELY. 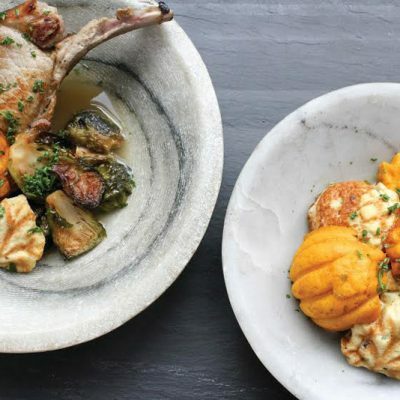 This dish is so delish, I made it twice in one week and I’m still wanting more. Recipe itself won’t feed a family of four though; be sure to double if you’re cooking for more than two or if you want leftovers (you will) to make all your coworkers jealous at work. Sweet!! Super glad to hear that, Portia! Wow. This was so amazing. I’ve printed several recipes off you website to have more variety in my meal planning and so far, every single one that I’ve made have been delicious! This recipe struck me as a little weird, since I had never had a plantain before but I thought I would give it a go. And wow, I will definitely make this a staple. The great thing about it was that it tasted cheesy, yet there was no cheese! Thanks so much for all your hard work, Steph! Sweet!! Super glad to hear that, Glory! Did you ever try freezing it? I’m trying to come up with freezer meals for after baby is born and I love this dish but I would like to know if you’ve had a chance to try it after it’s been frozen. Thanks! This one will freeze well 🙂 Congrats! !